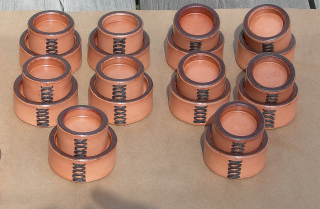 In the above pictures are the Leather Scope caps that I make. As all things that I do it started as something I couldn’t find or didn’t like what was out there so I decided to make my own. At first they were pretty crude but after many sets they evolved into what is pictured. For several years I would mostly give them to friends but for the time involved and the demand I decided to sell them on a limited basis. If you should inquire as to deliverability please keep in mind that they take approximately 2 weeks to finish one set given the dry times and work load. Below is a list of scope models that I currently make. 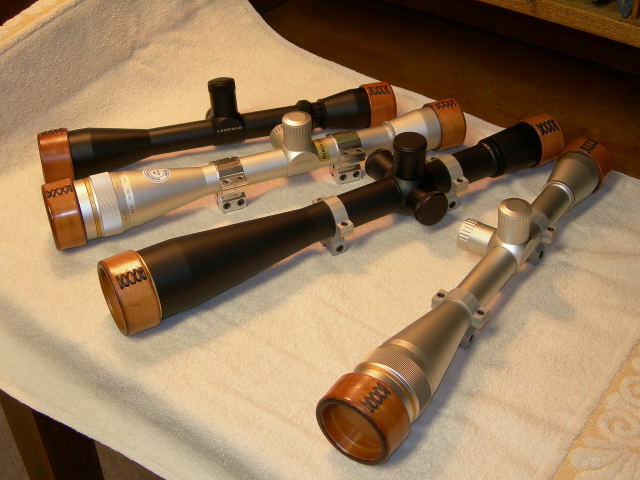 Note: I do not make caps for old military sniper rifle scopes; I do not make caps with a connecting strap, such items as this would be best contracted thru a local tack or saddle shop. There may be other models I can fit but would need an accurate caliper measurement of both ends to see if my dies will cross over. If you wish to inquire just type your questions in the (leave a reply) box at the bottom of this page, this will be sent to my personal account and I will respond to you by email after that. I do not post my personal email account on this site for spam reasons. I have been asked for several years to come up with and make some sort of muzzle protector. What I have in the pic above is the end product. I have tested this on my own rifles now for 2 years and haven’t lost one yet. This is something that happens to the neoprene caps or whatever else I have used in the past, they disappear to somewhere. The formed inner diameter is .900 nominal, with an oil finish to keep costs down. One should be able to fit most any muzzle diameter up or down by .100 and if it doesn’t fit up they can be wet and formed to your muzzle. I’ve had a set of covers for a March scope now for a while and love them. They fit like a glove and don’t fall off, yet I don’t have to fight to remove them either. An added plus is that they’re heavy enough to not blow off a bench in the slightest wind like plastic covers. They look great too. Rick, you’re a true craftsman. 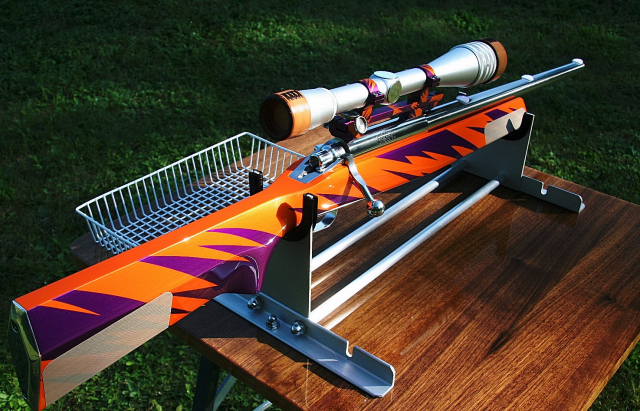 The scope caps are works of art. I know. I have a few sets. At one time you made and, I think, sold caps that had a snake skin insert at the ends. Do you still make those? The caps came in today’s mail, while I was in Kentucky shooting, they fit my Nightforce perfectly. I mentioned to the shooter next to me that I had leather caps coming, he wants your info, I’m pretty sure he will be ordering a set. Nobody down here has anything like this so you just might be getting some orders from the score shooters down here, most of them have Nightforce scopes. I’ll be showing them off in two weeks at Galatin, TN. Check will be in Monday’s mail, Thanks a bunch, they are a work of art. Fantastic craftsmanship, super kool retro look and practical. Worth every penny. And I am sure I will sell my pair yet again and then hollering for another set… Thanks Rick. I need a pair of caps for a newer Weaver T-36, do you have them in stock? Received my leather caps today, and they are made perfectly, very nice craftmanship, something you don’t see alot of today. Order Ricks caps and you won’t be disappointed.